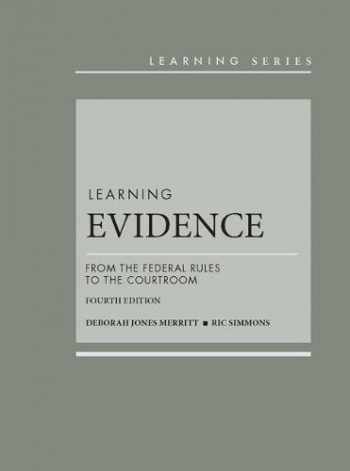 Acknowledged author Deborah Merritt wrote Learning Evidence: From the Federal Rules to the Courtroom (Learning Series) comprising 1102 pages back in 2017. Textbook and etextbook are published under ISBN 1634606469 and 9781634606462. Since then Learning Evidence: From the Federal Rules to the Courtroom (Learning Series) textbook received total rating of 4 stars and was available to sell back to BooksRun online for the top buyback price of $92.00 or rent at the marketplace. As a part of our CasebookPlus offering, you'll receive a new print book along with lifetime digital access to the downloadable eBook. In addition, you'll receive 12-month online access to the Learning Library which includes quizzes tied specifically to your book, video lectures, “Evidence in Practice” interactive trial videos, an outline starter and three leading study aids in that subject and the Gilbert® Law Dictionary. The included study aids are Federal Rules of Evidence in a Nutshell, Acing Evidence and Exam Pro on Evidence, Objective. The redemption code will be shipped to you with the book.Learning Evidence engages students by offering colorful courtroom examples, excerpts from trial transcripts, and lucid explanations of each evidentiary rule. The fourth edition has been fully updated to reflect the continued emergence of electronic media, the Supreme Court’s Sixth Amendment jurisprudence, and recent amendments to the Federal Rules of Evidence. To deepen student learning, the edition includes links to a dozen online videos, as well as interactive simulations in which students play the role of trial lawyers or judges.